Here's just a small sampling of some of the ways we illuminate the world around us with the arts at the center. 150 students participated in workshops that centered around the musical PUDDIN’ AND THE GRUMBLE at KANEKO in Omaha. Creating new work is at the heart of what we do. Whether it be our roles as producers for the ASCAP/Grow A Show Workshop at the Lied Center for Performing Arts, or originating new plays and musicals that tackle taboo topics, at BLIXT, we always have our sleeves rolled up and are ready to make something special. 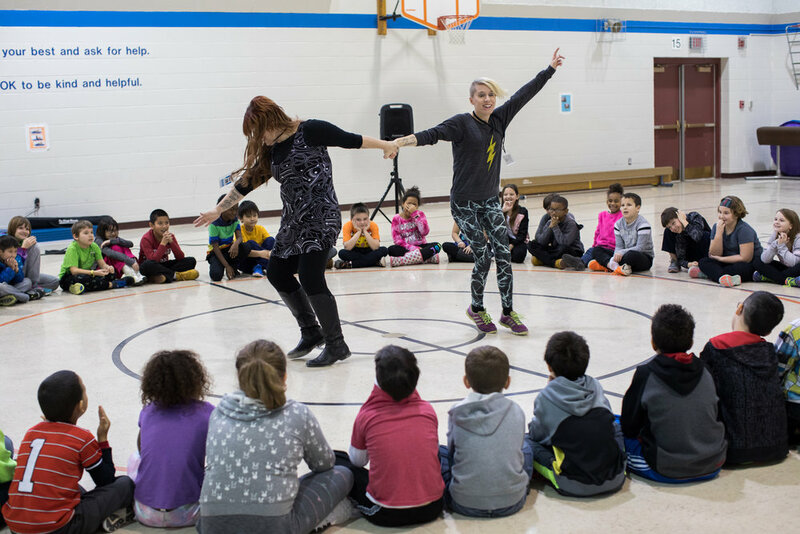 BLIXT Co-Founders Becky Boesen and Petra Wahlqvist explore negative space with students at Holmes Elementary School. At BLIXT we understand that the arts have a much bigger impact that they are often given credit for. While often we look to economics and test scores to support the value of the arts, BLIXT believes the real value of the arts resides in their unique immediacy and intimacy. Our world is scared. We’re afraid to say what we feel. We hide from ourselves. At BLIXT we crack that open and nurture all ages toward embracing their own voices and taking charge of their spaces. Let’s be frank: We dismiss the concept that the best ideas happen in a room full of suits with sharpies and wall-sized post-its where everyone leaves patting each other on the back and nothing ever changes. Instead, we replace such activites with deep connection, arts magic, and plans for action! BLIXT adds nonconventional touches to training sessions, retreats, productions, large events, and board meetings by letting go of the linear and embracing something much more personal. There’s a method to our madness…and maybe even some magic! Click here to learn how BLIXT can add magic to your next event!